Retired CIA agent Frank Moses reunites his unlikely team of elite operatives for a global quest to track down a missing portable nuclear device. In the first flick, retired CIA Agent Frank Moses (Bruce Willis) came out of retirement to protect a civilian named Sarah Ross (Mary-Elizabeth Parker). As Red 2 opens, we find those two amidst a happy life as a couple. 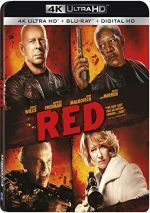 While nothing goes horribly awry with Red 2, the movie simply lacks the same loose charm and energy of its predecessor. It throws plenty of action and intrigue at us, but these component don’t boast a great deal of vivacity. Not that it doesn’t attempt a theme of sorts, mainly via the Frank/Sarah connection. In a modest manner, Red 2 attempts to use its story as an exploration of relationship issues. And I do mean modest. This concept crops up when the filmmakers need it, but the topic doesn’t present a lot of depth or meaning. The other actors fare better, but none of them seem as much fun as they did in the prior flick. While I won’t claim they’re punching the lock here, they simply don’t show the same sense of involvement this time. Red 2 appears in an aspect ratio of approximately 2.40:1 on this 4K UHD disc. Though the first film came with a lackluster visual presentation, the sequel looked great. This meant consistently sold definition. Virtually no softness cropped up here, so we got a tight, concise image. Moiré effects and jaggies failed to manifest, and I saw no signs of edge haloes or print flaws. Like the first film, though, this one did seem grainier than usual. In addition, the film’s Dolby Atmos soundtrack boasted high-powered thrills. With plenty of violent action on display, the soundfield – downconverted to Dolby TrueHD 7.1 on my system - enjoyed many opportunities to shine, and it took good advantage of these. How does the 4K UHD release compare to the Blu-ray version? The Atmos soundtrack adds a bit more kick and depth, while the visuals show moderate benefits. This means the 4K disc displays superior definition, blacks, contrast and color reproduction. I feel a bit distracted by the more prominent grain of the 4K, but I still think it offers the superior rendition of the film. In addition to the film’s trailer, a Gag Reel goes for four minutes, 24 seconds. It offers a standard array of goofs and laughs, though it comes with more profanity than most. A second disc presents a Blu-ray copy of Red 2. It includes the same extras as the 4K. After the fun thrills of Red, I hoped Red 2 would present another lively ride. Unfortunately, the sequel lacks the chemistry and excitement of the original, so it gives us a watchable but spotty adventure. The 4K UHD release presents strong picture and audio as well as mediocre supplements. 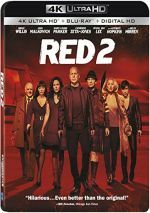 Red 2 becomes a perfunctory action experience, but this 4K disc turns into the best version of it on the market.